Dwyer, a genuine theocrat, also used to be the executive director of Michael Peroutka’s theocratic Institute on the Constitution. And like his fellows there, Dwyer has advocated the nullification of any laws that do not conform to the group’s “Biblical worldview.” Dwyer accordingly introduced nullification bills in Maryland, explaining that “[n]ullification is not an act whereby a state simply refuses to comply with a Federal law it does not like, it is the claim that the law is not a law at all because it is unconstitutional.” He is himself a defender of legally required religious tests for office (more here). 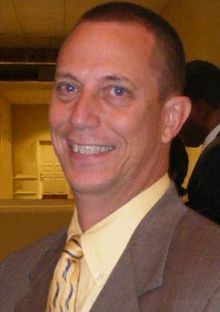 In 2013 Dwyer, who gained some fame when he acted out an Annapolis version of the Boston Tea Party (donning a tricorner hat and Colonial breeches to dump tea into the Annapolis harbor) and was named Legislator of the Year by Larry Pratt’s group Gun Owners of America, started a DINO campaign to get wingnuts to register as Democrats in order to pull the Democratic party to the right: “If the gun community alone follows me in this strategic plan, we will have a devastating effect on the next statewide election,” he argued. One who followed Dwyer’s advice was Consitution Party candidate and League of the South chaplain Pastor David “God-given right to secede” Whitney. Diagnosis: Abysmally crazy theocrat. Fortunately (relatively) neutralized, but his allies are still running disconcertingly strong. A constitutionalist who doesn't under the No Religious Test clause? For shame.